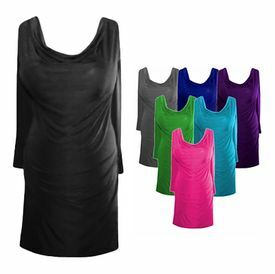 These tops have a pretty drape neckline. The fabric is wonderful & a breeze to take care of! Throw it in the washer, dryer, and straight into a drawer or suitcase, take it out days or weeks later, and it's ready to wear! As with all the slinkies, they rarely wrinkle, are very stretchy, and hang great!